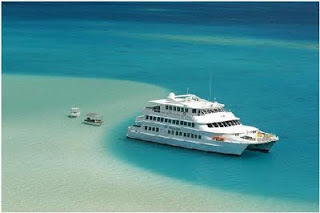 Haumana, a 35m luxury yacht cruising the most beautiful lagoons in French Polynesia. Fully refurbished in 2007 to a very high standard. 1 spacious cabins, all with wide windows, an ocean view and a queen size bed. The 17 cabins include a television and DVD and a CD/radio, air conditioning, safe deposit and mini bar, a private bathroom equipped with hair dryer.